House, 4 Bedrooms, 3 Baths, (Sleeps 10) -- newly renovated bathroom + new sofas! Just off of 'Born Free', the ski run leading to the gondola. The house is 120 yards from the ski run and overlooks the magnificent Gore Range Mountains. Named 'Chalet du Soleil', this charming four bedroom home is within easy walking distance of fine restaurants and shops. The house is on a large lot. Sledding and playing in the snow can be enjoyed by those with excess energy after skiing. We provide the sleds. The house is equipped with all the amenities you are accustomed to in your own home. The house comfortably accommodates up to ten people. The master suite features a queen-size bed plus whirlpool tub for two (jacuzzi type) and separate shower room. The other main floor bedroom includes a queen-size bed, bath/shower, and an expansive bay window. The third bedroom on the upper floor has a queen-size bed, two twin-size beds, plenty of closet space, and a large vanity sink area. The fourth bedroom is, in fact, an adjoining studio-apartment with king-size bed, compact kitchen and full bath. All beds are made up in the Swiss-style with comforters, extra pillows, and ironed sheets. Limit 10 people, in excess of that number renters are subject to forfeiture of security deposit. Please provide names of all occupants. Owner reserves right to knock and check on state of unit during reasonable hours. Any sign of tobacco, vaping or marijuana use will result in eviction if found out during the stay, this includes on the decks. If smoke or paraphernalia is found post stay by the cleaning crew and documented then the entire $1000 deposit will not be returned. We have not had to enforce these policies and hope to keep the record of people enjoying our family home without incident. The owners, Fred and Thea, live in the house next door and will be happy to make your stay a pleasant one! Their daughter, Heather Kehoe, lives in Eagle and manages the property. This is a family-run business. Thea Rumford and daughter, Heather Kehoe, manage this beautiful mountain home. The photo is of Heather and Thea on the deck of the Chalet in the summertime. Fred and Thea Rumford have owned this charming mountain home since 1966 when it was built as a weekend getaway for their family. Skiing is a large part of their lives. They have raised their children to grow up with a tremendous appreciation for the alpine lifestyle. They take great joy in now seeing their grandchildren follow in the ski tracks of their parents. Thea says, 'The character of Chalet du Soleil is incomparable and is sure to please.' The Rumfords also take pride in upgrading and maintaining their beautiful home each year. It's the little things that the owners/manager do to make this place special. Prime Lionshead location. Specular views of the Gore Range Mountains. Very family friendly accommodations. with lovely water feature running thru the property in the summertime Please do not allow your children to play in the water feature. Thank you. 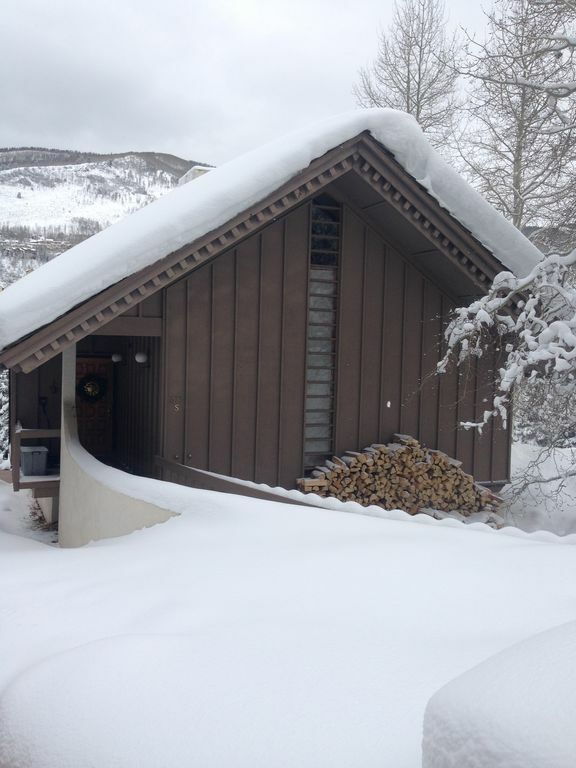 There are 4 outside parking spaces in front of the Chalet for your use during your stay. Parking on the residential street (Forest Road) is not allowed. Thank you for your compliance. There is now a new natural foods grocery store in Lionshead Village by the main bus stop, a short 5-7 minute walk from the Chalet. Great for those few items you may have forgotten or need at the last minute like milk and eggs. Across Gore Creek from the gondola.